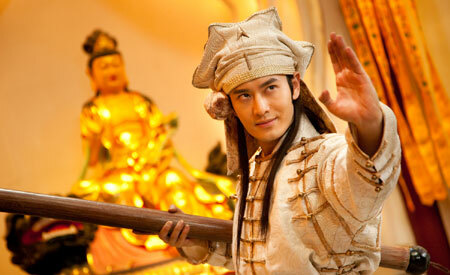 Huang Xiaoming is Tang Bohu in Flirting Scholar 2. The Skinny: So late, so little. Huang Xiaoming and Zhang Jingchu are not enough to save this tired and remarkably unfunny sequel to Lee Lik-Chee's 1993 blockbuster Flirting Scholar. Not starring Stephen Chow, naturally. Who saw this one coming? Probably no one. Seventeen years after earning mega money with the super box office hit Flirting Scholar, director Lee Lik-Chee returns with – what else -- Flirting Scholar 2. However, did people really dig the 1993 original because they took a super liking to that particular film's brand of Huangmei opera-inspired nonsense comedy? Or did they turn out in droves because it happened to star some guy named Stephen Chow? I'm betting on that latter reason, and since Lee didn't bring Stephen Chow with him for Flirting Scholar 2, the whole production earns a big red flag. Flirting Scholar 2 also gets a red card, because it's pretty much a stinker that wouldn’t impress anyone looking for a little effort from their movies. Superficially, the film isn't a bad idea. The production values are passable and the performers are at least decent quality. Stepping into Stephen Chow's shoes is super-handsome Huang Xiaoming, who likely earned the job of playing Tong Pak-Fu (Or Tang Bohu, as the subtitles now insist on calling him) thanks to his popular TV drama turn as Wai Siu-Bo (played previously by Stephen Chow and Tony Leung Chiu-Wai, among others). Opposite Huang is Zhang Jingchu, who's always worth watching, and a who's who of Stephen Chow cronies show up in supporting roles. So far so good. So what went wrong? For starters, the first half of Flirting Scholar 2 is an absolute chore, possessing the same amount of laughs as you'd find at a triad funeral. Mimi Chu reprises her role as Tang Bohu's mom, and Nat Chan Bak-Cheung also makes a return as one of his scholarly comrades, but both pretty much repeat the same shtick from the previous film, right down to copied situations and sight gags -- including one where we see Nat Chan without any clothes. Um…yeah. Things pick up a notch with the arrival of Fan Siu-Wong as a guyliner-sporting evil pirate, who disguises himself as a monk in order to kidnap women for some ungodly eastern country. Regardless of yet another hint that other cultures (like Japan maybe) are the true enemy, the antagonists here are just some evil Chinese, and it's up to Tang Bohu and the filmmakers to rout the baddies. However, along the way they make enemies of the audience too. How do the filmmakers achieve this feat? First of all, they deliver too little of Tang Bohu and too much of his pals, namely Chan Bak-Cheung, Richie Jen and Zhou Libo as three other Ming Dynasty-era scholars. Flirting Scholar 1 also featured these characters, but it quickly sidelined them for Stephen Chow, Stephen Chow, and even more Stephen Chow. Basically, Chow carried that film with his comic persona change-ups, which saw him switch from cool charisma to whip-smart wiseacre to self-deprecating dope. Huang Xiaoming covers the same range, but he's not the one the audience is following. Rather, it's the abundance of tired jokes and parodies that move the film along, and not Huang’s mugging or attempts at coolness. Huang can be a funny guy, and he's certainly handsome, but he can't surprise the audience like Stephen Chow can. Neither can Lee Lik-Chee, especially when he's repeating so many jokes from movies that aren't even his. Aside from the Flirting Scholar retreads, Lee also steals an entire gag from the Lucky Stars series involving, uh, Nat Chan taking off his clothes and wandering around naked. Again. There's also plenty of bathroom humor and an amusing and overused gag that apes Transformers. Richie Jen fares okay in a secondary role, while mainland actor Zhou Libo proves more amusing as the fourth scholar. The abundance of former Stephen Chow co-stars (Yuen King-Tan, Law Kar-Ying, Lam Chi-Chung, Tin Kai-Man, Cheng Cho) provide a little "spot the actor" fun, while Fan Siu-Wong earns laughs because of his ridiculous eyeliner. Zhang Jingchu does fine when called upon to bring the drama, but it’s hard to gauge her comic chops because the jokes are so tired and poorly staged. Zhang may be a skilled comedienne but you won't find much proof of that here.